Leaky Gut Syndrome is a multi-layered digestive disorder that leads to many other chronic health problems. This disease deals with the slow destruction of the intestines in a way that waste products are not filtered out from important nutrients, hence, an unwanted amount of waste accommodates or “leaks” in the body. Traditional Chinese Medicine provides an effective form of treatment for leaky gut stndrome. One of the treatment techniques is acupuncture. Out of the twelve meridians (channels), usually the liver, spleen, kidney and heart meridians are disturbed in leaky gut syndrome. Needling these meridians helps retain the balance or the flow of Qi. Combining this form of treatment with Chinese herbs has shown a positive effect on the treatment of this disorder. This is the root cause of many ailments in the body, as stated earlier, and addressing a leaky gut will certainly help you regain your health. Irritable Bowel Syndrome is one of the most common ailments that Americans have to go through. It is the number one cause for missing work or school. IBS has been linked to chronic stress and leaky gut syndrome and it’s symptoms can be reversed. A number of factors, such as contaminated water, undercooked food, etc, can cause diarrhea. Acute forms of diarrhea are accompanied with symptoms like dehydration, nausea and loss of appetite. Acupuncture is a reliable method to treat acute disorders like these effectively. The stomach is the main meridian that is attended to. Instant relief can be felt within minutes of needling. Acupuncture for chronic forms of diarrhea has shown positive results when combined with moxibustion (A spongy herb called mugwort is used to promote healing) and herbal therapy. All forms of diarrhea require a fully hydrated diet to overcome symptoms of dehydration. Peppermint tea, hot soups infused with Chinese herbs are advisable. Constipation is one of the most painful digestive disorders that a large majority of the population in America faces. Its symptoms include irregular bowel movements, painful passage of dry stool and straining of the sphincter muscles. The acupuncture points for constipation are mainly present on the large intestine. 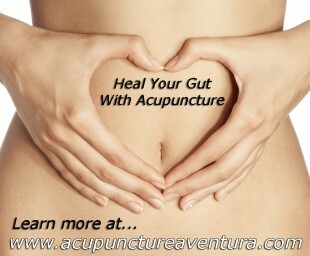 The stomach and liver are also important acupuncture points that are used to treat constipation. Modern day medicine has shown that stress is also the cause of constipation and acupuncture has been shown to be a fantastic remedy for chronic stress. Diverticulitis is the presence of a multiple number of small “pouches” that are inflamed and bulge out from weak spots on the colon. A diet, which is low in fiber intake, is the said to be the main cause of this disease. Various studies have shown that acupuncture helps alleviate pain and other symptoms of diverticulitis. Before beginning the treatment of this disorder, acupuncturists analyze the individual in order to assess the underlying causes of the disorder. An imbalance in the Qi is balanced by needling meridians on the large intestine. Combining this with Chinese herbal medicine has shown general improvement in gastrointestinal health. Gastritis is an inflammation in the gastrointestinal tract. Some of the symptoms include nausea, bloating, belching, weight loss and loss of appetite. Gastritis is caused when the protective mucus lining of the stomach starts to degenerate. This causes acidic digestive juices to flow freely in the gastrointestinal tract causing painful inflammation. Acupuncture is an effective form of treatment for the relief from symptoms like nausea, stress etc. Along with promoting the healing of the stomach lining, this form of treatment helps improve overall digestive performance. Traditional Chinese medicine, when implemented with proper lifestyle, dietary and acupuncture treatments has shown to alleviate most digestive disorders and prevent future problems. At our center, we provide you with the best available forms of treatment for digestive issues. Please call us at 786-537-7022 to get started today!